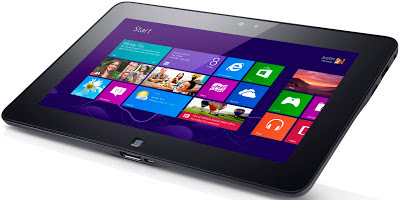 At the recent Dell World conference I had the opportunity to try out a slew of new Windows 8 devices. I was struck by how many potential healthcare applications this new platform and the mobile devices it has spawned will be available. Windows 8 could have some significant ramifications for use in healthcare. As Denise Amrich, RN and a healthcare advisor for the U.S. Strategic Perspective Institute in her ZDNet post "Why Windows 8 may be the ideal tablet OS for healthcare" said, "Windows 8, like Windows 7 before it, integrates beautifully with Windows server technologies. Windows 8 adds additional security features and works smoothly with Exchange, SharePoint, Windows 2008 and Windows 2012 Server. Of particular interest to healthcare professionals, Windows 8 also supports Microsoft Lync secured messaging, so IM messages that go between medical professionals can be both instant and rock-solid secure." The ability to seamlessly integrate Windows 8 tablets into the enterprise, and to run legacy Windows based EHRs will allow clinicians to finally have the mobile form factors they have been looking for. I agree with Bill's assessment and in particular think that the new tablet devices will be very attractive for use in healthcare. At Dell World I tested quite a few of the new form factors available on the Windows 8 platform including the XPS 10 tablet, the XPS 12 convertible Ultrabook, and my favorite the Latitude 10 Tablet (thanks to Dr. Joseph Kim for letting me have his place in line to purchase one at a steep discount :). I think the form factor and usability of the Latitude 10 approaches that of the iPad, and for all the reasons listed above make it a much more suitable device for the healthcare industry. Using the Dekstop app gives me a full featured Windows desktop that can run all my applications, and other medical apps running native to Windows 8 and RT are sure to be developed. NextGen Healthcare has already released an app called Medicine Cabinet which allows consumers to create, store, track and share personal medication records. I expect the next year to see a great influx of new apps appearing on the scene. Microsoft has also demonstrated (see below) a prototype of an application for Windows 8 it is calling "Rounds," which is designed to streamline healthcare professionals workflow in hospitals as they communicate within their care teams. Clinicians can click on a grid of patients, view data from EHRs, and hold a video conference with a specialist. Although it is just a prototype at this point, it nicely showcases the touch screen capabilities of Windows 8 tablets. This app is one example of how Windows 8 can combine the functionality of a full PC within the interface of a tablet. Another very interesting feature of Windows 8 is Windows To Go. Windows to Go allows Windows 8 Enterprise to boot and run from mass storage devices such as USB flash drives and external hard disk drives. Basically it enables administrators to configure an image of Windows 8 onto a USB stick. Using a personal tablet or other mobile device to access a hospital network through Windows to Go is a good way to deal with some of the security concerns of BYOD and mobile device management. Microsoft seems to have bet the farm on Windows 8, and so far the bet appears to be a good one. With greater emphasis on security and mobility the new platform looks to be a winner, and unlike Vista will likely be adopted fairly quickly. Previously devices and applications have been slow to meet the productivity and security requirements of the healthcare industry. As these new devices continue to improve in usability and more apps are developed on the Windows 8 platform, I expect to see some pretty broad deployment of both the platform at the enterprise level as well as many of the new mobile devices in the healthcare industry. Your blog came at the right time for some needed encouragement about Windows 8. I just got a new laptop with Windows 8 and am trying to learn the ins and outs. As a training professional, I know my learning style -- so it's time to take the tutorials to get me up to speed.